As you might have read, night one was a success. 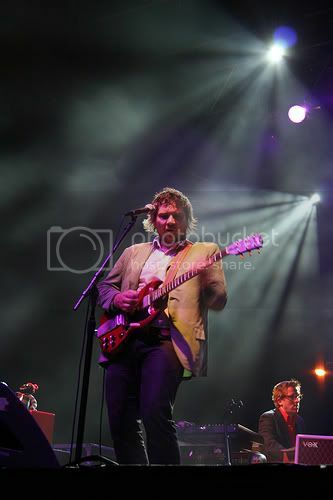 But could Wilco follow it up with a second outstanding performance, one that made a much longer trip worthwhile? Short answer: Of course they could. My doubts had already been staved off by the Savannah performance, so I went into Atlanta with a bit more optimism, although readily expecting to see a lot of the same ground covered as the night before. As mentioned, our seats were row R, although at the Fox that's really not so distant from the stage. However, we were on the far end of the row, so it was akin to watching a TV from a 50 degree angle: a little uncomfortable at first, but you could still see everything just fine. The crowd was exponentially better as far as I could tell. Folks there for the music, the "Jesus Etc." sing-along was far more participatory, and the acoustic set rose above any crowd noise. This might be because we were closer and more ensconced in the true fans, or perhaps a big city crowd just knows how to act. Whatever the case, it was a far more enjoyable experience from that standpoint. At one point, a front row ticketholder got the boot early on after allegedly trying to photograph the band. Online chatter suggests he may have been simply checking his phone; but regardless, the guy got the heave ho and I'm not sure if he ever made it back in. The set started identically to Savannah's, with the robotic announcement and the corny introduction. The first handful of songs were by and large the same, until "Nothingsevergonnastandinmywayagain", the hard-hitting Summerteeth indie-pop jam. From there it was only repeats until the acoustic set, again borne out of the noise finale of "Poor Places". If you had asked me what three songs I would like to hear, I might have said "'Far Far Away', 'Hesitating Beauty', and anything from A.M." Incredibly, I was met with all three over the course of six songs. In fact, the boys played two from their underrated debut: A folkabilly version of "Casino Queen" that sounded not unlike Ryan Adams' "To Be Young"; and a version of "Passenger Side" that had the whole place hollering the lyric, "You're gonna make me spill my beer/if you don't learn how to steer!" The latter portion of the show was essentially a repeat of Savannah, save for a blistering version of "Theologians" with Tweedy screaming the high notes over its powerful bridge. After the "Thank You Friends" encore, the lights went up, and my Wilco two-nighter was complete. We hurried to the parking lot and navigated the clotted streets around the Fox, found our way onto 75/85 South, and hopped onto I-20. A full tank of gas and a fourth meal at Waffle House later, we were en route to Charleston, where we'd groggily roll in at 5:30 A.M, just as Eastern sky was glowing a bit. Once again, I was floored by the Wilco machine. I've realized that this is virtually a no-risk situation, that between my unbridled fandom and their ability to deliver, I won't be let down. Not even one or two disappointing outings would dissuade me from hovering over the next presale. So how does a band that tours so damned much, a band I've seen eight times in five years, remain consistently enjoyable? It boils down to the fact that Wilco is self-aware. And they should be; Jeff Tweedy (and perhaps manager Tony Margherita) has gone to great lengths to turn this band into exactly what it is. He's fired dissenters, he's snubbed his record company, he's regulated concert photography, he's made decisions that have developed the Wilco brand--one that, again, they're keenly aware of (see "Wilco (The Song)".) And it's a well-run business, one that is grossing $75,000 a night not including ticket percentages and merch sales (source: I know a guy). But the awareness is also reflected in their live shows. Most bands and artists I've seen, whether you like it or not, are going to load setlists with new material. Tom Waits, Radiohead, Ryan Adams, the Hold Steady, etc...probably 75% of their sets are comprised of output from the most recent 20% of their career. Audiences know this going in, and any old favorites they hear are gravy. Perhaps this is the result of artistic viability: All of the aforementioned artists (even if Adams is in a slump) are still releasing relevant and well-received material. On the flip side of that equation, consider Elton John, who I saw a few years ago. He had a new record out, and played a handful of new songs right off the bat. But after that, the show read like the back of a greatest hits album. And that's to be expected of a legend who's asking a ton of money from his fans. Wilco, however, is smart enough to achieve a balance. They're still considered a critical force, yet they pepper their sets with just enough of the established, old-guard routine to make it work. They play new stuff and (unlike at an EJ show) most fans actually know it and enjoy it. As you've read, they've embraced, for lack of a less scathing word, stunts that won't earn them any credit with rock show purists. They raffled gift certificates, for instance, at both the Savannah and Atlanta show (and all others on this tour, as I understand.) Fans entered the raffle by making a song request on their website, and the winners not only get the gift certificate, but they get to hear their request (except for one person who made a "crappy request" and one guy who requested "I Am Trying to Break Your Heart". Tweedy, to the latter: "As if we weren't going to play that song anyway...use your head!") So there's all that, there's the "Jesus Etc." sing-along, there's the "Wilco (The Song)" name check sequence...all in all, theatrics that seem more befitting of an interactive kids concert than a rock show by a band once at the vanguard of progressive indie rock. But as all this goes on, Wilco still winks and nods at the true devotees, the music fans among us who'll shrug off the shenanigans just to hear the feedback swirl of "Handshake Drugs" and the twisted lyrics of "She's a Jar". We'll deal with the inherent silliness of writing a song about your own band because they'll still reach back and play deep cuts and beloved classics in droves. And why? Because they're self-aware. They exist in a rare plane: the overlap of reverence and relevance. And that, I'd argue, is a pretty special place to be. In EJ's defense, the concert was canceled the first time and we got credit for our tix at the 2nd show. And i think they were only like $36? not bad I think.